Get a taste of a region that enjoys life. Le Chabada for the latest sounds, Le Quai theatre for stage or contemporary dance productions; the THV, the Arena or the Amphitea for big concerts; the Grand Théâtre d’Angers for operas and concerts performed by the Pays de la Loire National Orchestra… and Angers’ calendar is punctuated by reputed festivals such as Premiers Plans, Tempo Rives, Festival Estival, the Accroche-cœurs, or the Festival d’Anjou. Quality of life in Angers also means enjoying a stroll around the city and admiring the castle of the Dukes of Anjou with its 17 tuffeau stone and slate towers; or a shopping spree in town centre, which is easy to access; or perhaps heading to the Ile Saint-Aubin, or one of the local “guinguettes” – simple riverside restaurants dotted along the banks of the Loire – or Les Sablières beach in Ecouflant. Angers – just enjoy it! Ideally situated at the gateway to Western France 1.25 hrs from the Atlantic coast and famous for its pleasant climate, Angers is officially recognised as the greenest town in France, with 51m² of green spaces per resident. There are parks and gardens everywhere across the region. With its young population (48% are under 30, 25% are students) and ambitious urban schemes, Angers is surprisingly well-balanced. Long recognised for its gastronomy by Rabelais and Curnonsky, in Angers, we take our time to savour the delicious wines grown from varieties like Chenin, the Loire’s most noble grape. Some of the reasons people state for moving here are the affordable cost of living, the fact that it’s easy to find somewhere to live, or because getting about is simple, whatever type of transport you prefer. Angers is popular among Parisians who have left the capital, as the region has all the ingredients for a harmonious work-life balance. 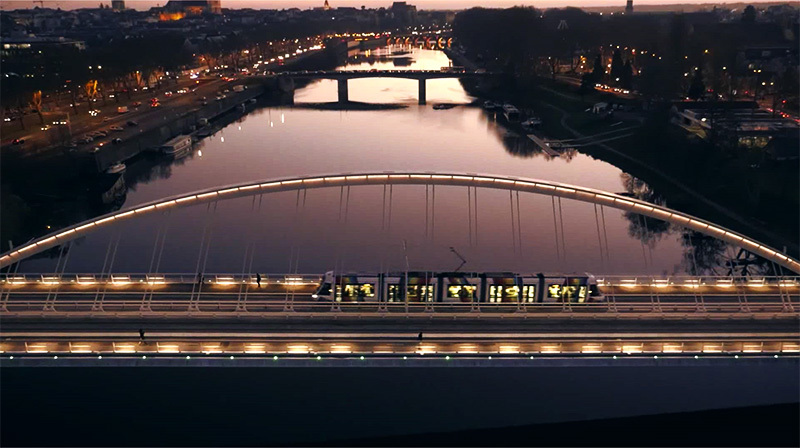 Just 1.5 hours from Paris Montparnasse by TGV, Angers is a large, modern town which cares about preserving its environment.